BLVDAVE: Podcast on the AVE: BlvdAve Radio EP. 13 "Bait Trucks, Flash Suits, and all that Jazz"
Podcast on the AVE: BlvdAve Radio EP. 13 "Bait Trucks, Flash Suits, and all that Jazz"
Welcome to Episode 13 of BlvdAve Radio !!! We start this ep off with some social talk, as we had recently here in Chicago a "Bait Truck" placed in an Urban community and it set off quite a stir in the city. We also break down how one's perception about a situation can change depending on both one's race, as well as occupation. 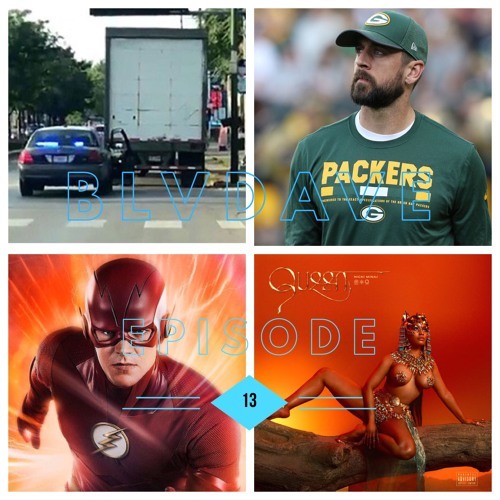 From there we got into some Movie talk, "The Flash" season 5, Aaron Rodgers statement about NFL Anthem protest, Gas station P givin' up on Kanye, and the Queen Nicki Minaj dropping her album a week early and coming for her "Throne." As always check out BlvdAve Radio every Tuesday at 7PM on Logik Radio (http://www.wlgkradio.com) followed by the podcast platforms release every weds. Follow BlvdAve_Radio on IG, www.instagram.com/blvdave_radio as well as on twitter twitter.com/blvdave_radio . Check out the blog www.blvdave.net, and for guest inquiries or if you want BlvdAve Radio to promote your product, email us noemimediagroup@gmail.com ! This Episode is brought to you by Lay Low Apparel! Need some new gear ? Check out their website, www.laylowapparel.com , and make sure you use the code "blvdave" to received 10% off of your purchase. Also check out www.muzmm.com for all of your backpack needs, and you can also received 10% off there with the code "blvdave." Last but not least, Vape users hit the link 297vitaminvape.refr.cc/blvdave to received 25% off your first VitaminVape purchase ! Last but not least, now you can make delicious meals with Blue Apron ! Click this link to received some money off of your first order !